A few weeks ago, I wrote about a new rebate available to Southern California Edison customers that drive a Plug-In vehicle. I had thought that the program was limited to BEVs, but apparently it is also available to Plug-In Hybrids as well. To give some update regarding the status of the three applications that we’ve done in our family I would like to provide the following status. Our Roadster application was accepted and confirmed as received on May 22, 2017 at 4:09 PM. 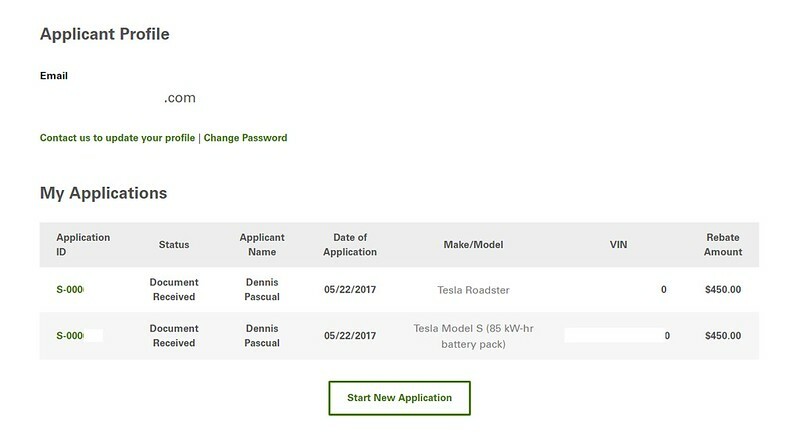 Our Model S application was accepted and confirmed on May 22, 2017 at 4:26 PM. However, the Model S rebate was approved on June 5, 2017 at 3:28 PM (as can be seen on the screenshot above.) Even though the Roadster rebate application was completed about 17 minutes earlier than the Model S application, the rebate was approved about 20 hours later on June 6, 2017 at 11:16 AM. Additionally, my mother’s Leaf was approved on June 7 at 5:55 PM and her application was about a day after our two applications. Her application is numbered between 1100 and 1200. So, hope that helps others figure out when they should get the email confirming their rebate request. I was made aware of a program offered yesterday for new, existing owners of electric vehicles in Southern California Edison territories. This is an interesting rebate in that participating vehicles need not be purchased new. A particular vehicle and household can use the rebate once, but up to two more subsequent owners of that same EV are also eligible. (If the owner that applied for the rebate re-sells the car, the buyer, can apply for another rebate in the SCE territory for up to two more subsequent owners.) 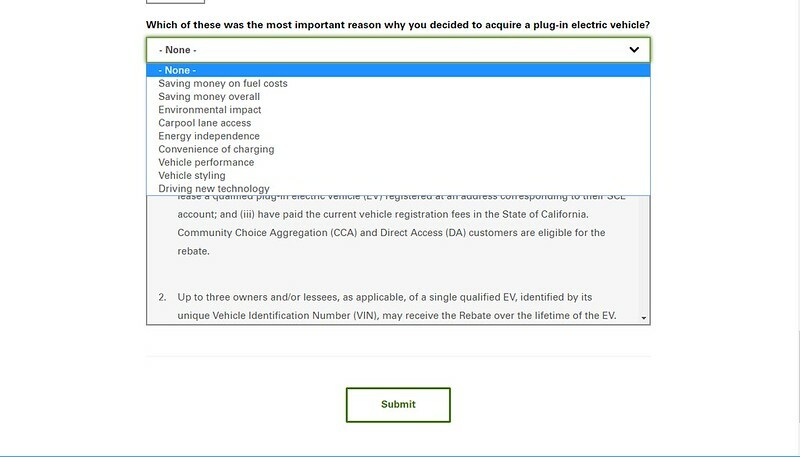 This applicability for used and currently owned vehicles is fundamentally different than the original California state program which was limited to brand new EVs only. Furthermore, providing for future resale to other SCE utility customers, shows a commitment to the future for this program. Where to start, well, the SCE “special” website that is gathering all applications for this website is https://www.scecleanfuel.com/. Understanding that you may have some additional questions, here are the FAQs – https://www.scecleanfuel.com/faqs. So, what do you need to prepare for filing. In my case, I had to create a login for scecleanfuel.com (this is different than your regular service account) and is a rather straight forward process that took longer to read all the disclosures than actually click and accept the terms. Second, I had to find and obtain my service number (which is readily available on the PDF bill (or paper bill)) from SCE. Without the bill, it’s available on sce.com if you have a registered account on THAT system. 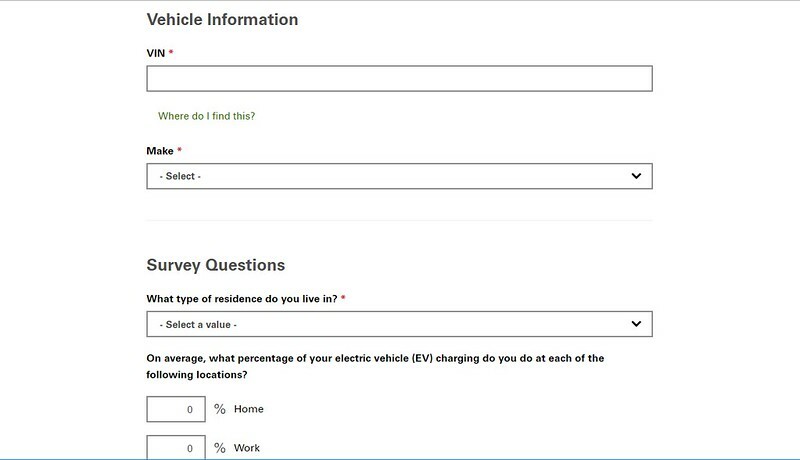 Next, you fill out the online form on scecleanfuel.com. Here are the screens to fill out, in reality, it’s one long one. 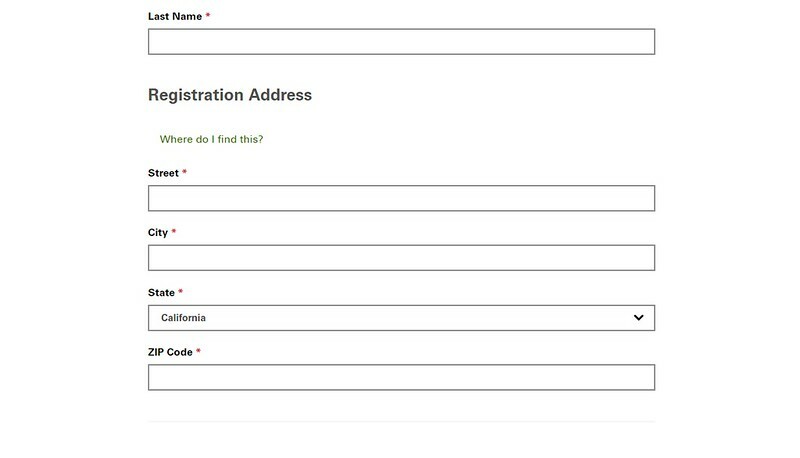 In total after clicking submit, the next page (which I forgot to get a screenshot of) will require you to upload a scan of your registration. Luckily, I typically scan my registration for my records, so this is good. 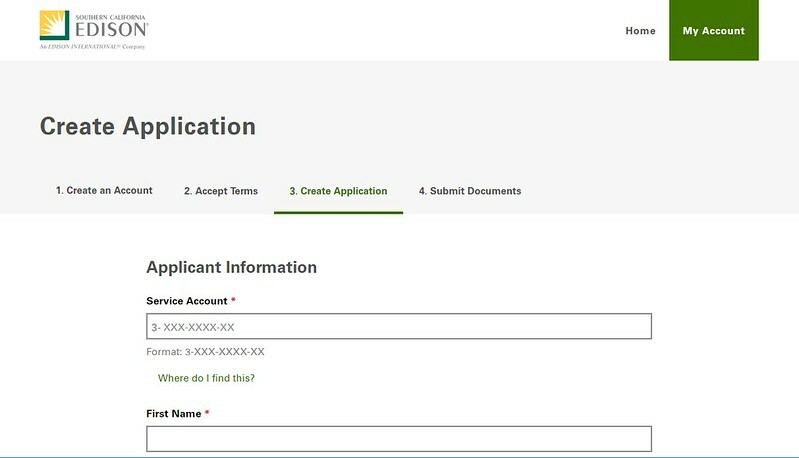 Once you upload your registration, your application should show the status of the application and you wait. Here is a screenshot of the page for our application for our two EVs. We filed yesterday afternoon (May 22, 2017) and our applications were already in the mid-hundreds. About 22 hours later, my mom (assisted by my sister) filed hers and her application was in the one thousand applications… I’m not sure how many applications will be accepted for this, but I always feel that these are almost always first come, first serve, so get your paperwork ready and apply. If we sell an EV and there are still funds in the program, subsequent purchasers (up to two more times) of an EV that is placed in service at SCE territory may be eligible for this rebate again. 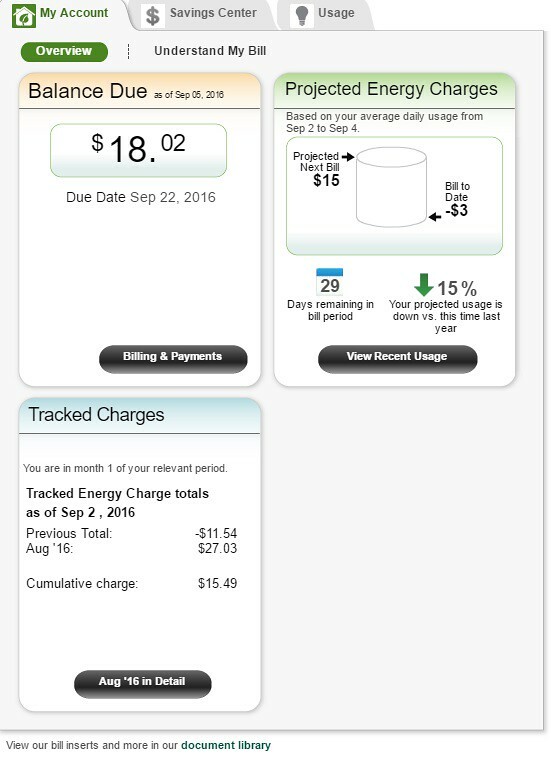 The amounts may change in subsequent years, but it’s a nice little benefit for being a customer of Southern California Edison. Once we receive a copy of your permanent vehicle registration we will review your application for completeness and accuracy. This process may take up to 30 calendar days. Delays beyond normal processing times may occur. If your application is approved, we typically issue rebate checks within 90 days of application approval date. All status updates are communicated through your email. 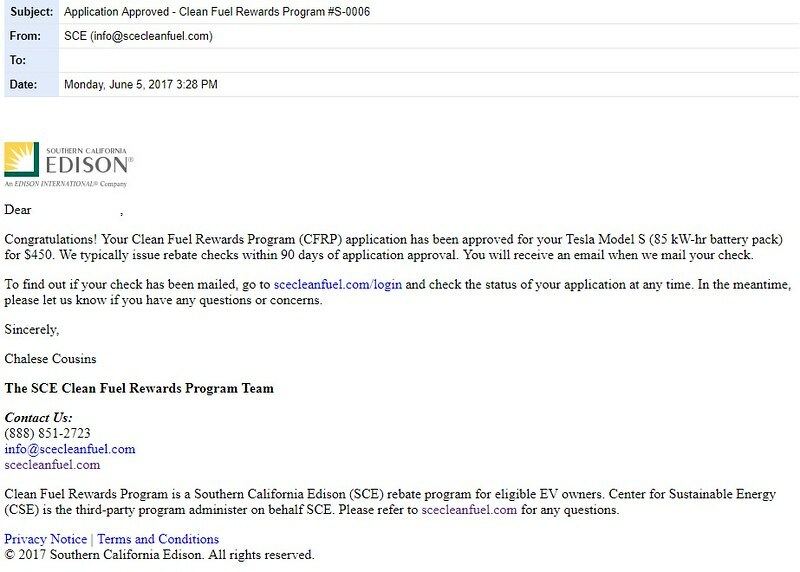 As we cannot guarantee our emails will not be blocked by your email server, we highly recommend periodically visiting scecleanfuel.com/login to check the status of your application. Our fourth year of Solar usage. This is our fourth year update. Click here for the Last Year’s (3rd Year) Summary. It’s been four years since our PTO our solar array was approved, we originally estimated our savings on driving the Active E or a vehicle like the Active E. Since then, we moved from driving one EV to two EVs to three EVs and finally back to two EVs. We’ve also driven around a lot and our mileage has grown significantly since then. Our original estimation of a break-even was calculated with a one EV household. Since then, we believe that we’ve achieved our break-even mileage for our EVs and home use of electricity between last year’s update and this year.. In our first year of Solar use, we had a credit. Which, as we found out, we could not claim. Because, it turns out, Net Metering means that though we’re credited for the production at a specific $ rate, customers are paid out on OVERPRODUCTION of power and not on the CREDITS earned. What this means is the system produced greater kWh of energy than consumed by the end user. If this is the case, the customer is PAID OUT the power times the wholesale rate of production. As long-time readers are aware, on our second year, we paid over $200 to SCE. For our third year, coupled with our nearly a month of travel to Maine and back in our Here, There, and EVerywhere roadtrip, we were out of the house for about three weeks that year, and a little over a month for that year. So, that created about a month of overproduction. As a result, Year 3’s bill was approximately $40. This fourth year that just ended, we had about the same number of weeks away from home, but our annual net metering statement is about HALF of last year’s total with a nearly $20 bill for Year 4. This full fourth year of solar production is firmly with the Model S and Roadster with a about the same number of weeks on trips as Year 3. Our 2016 Road trip to the Pacific Northwest, which we will be publishing on Monday, 9/12/2016 at 10:00 AM Pacific/18:00 BST/19:00 CET (UTC), was for only two weeks, however we’ve had a lot of other trips so that our total time away from home has been about the same as Year 3. I considered the third year as a monumental year for having the $40 annual bill, I am just flabbergasted at the $20 year that we’ve had for the fourth year. Considering our average electric bill prior to going EV and solar was closer to $200 a month, it is incredible to get most of our transportation and home energy use at so little. Additionally, I focused on the change in tariff from TOU-D-EV to TOU-D-A in last year’s summary. Logic tells me that I SHOULD have been paying more for electricity in Year 4 vs. Year 3. And we didn’t even travel any more than we did in Year 3. Our Summer roadtrip in 2016 (about our Long Way Round to the Tesla Gigafactory Party) was several days shorter than our 2015 Roadtrip. I guess we’ve gotten better at shifting our energy use. I wonder what we’ll be spending on energy next year? I predicted an upward trend from Year 3 to Year 4 and was flat out wrong. So, let me see if an upward trend will finally hit from Year 4 to Year 5. After all, solar panels degrade and our guaranteed production on our solar agreements always step down year over year. Interested in going solar? Get a quote from my solar vendor – Real Goods Solar. Posted on September 9, 2016 September 12, 2016 Categories Solar, Tesla, Tesla Model S, Tesla RoadsterTags Net Metering, SCE, Solar, Southern California Edison, TOU-D-A1 Comment on Our fourth year of Solar usage. Our third year of Solar usage. This is a third year update. 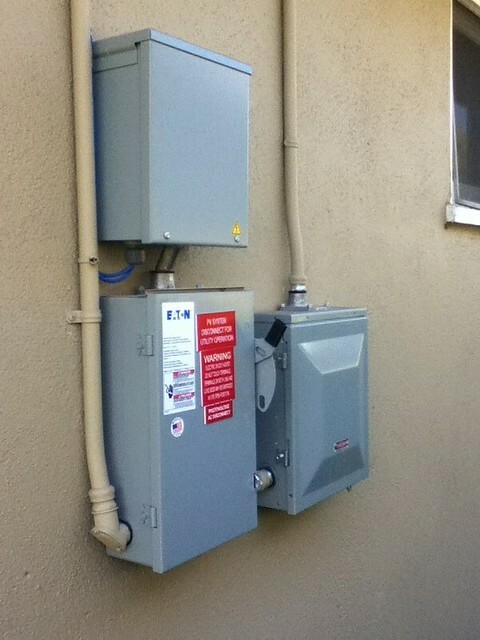 Click here for the 2nd Year of Net Metering. 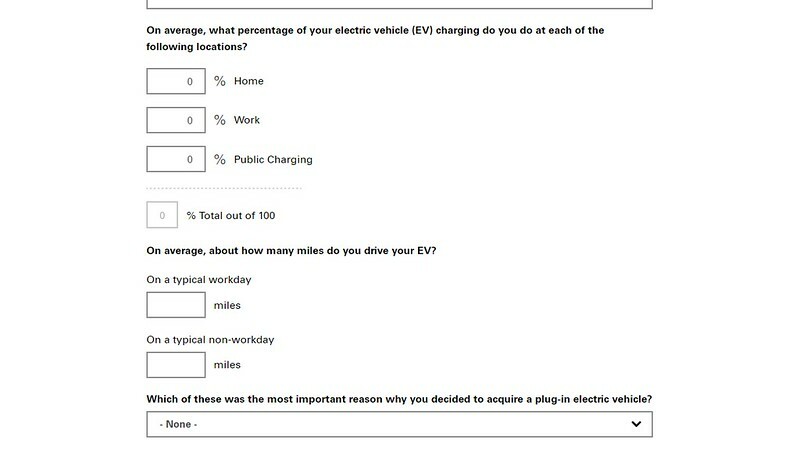 It’s been three years since our PTO was approved, we originally estimated our savings on driving the Active E or a vehicle like the Active E. Since then, we moved from one EV to two EVs to three EVs back to two EVs. We’ve also driven around a lot and our mileage has grown significantly since then. I haven’t done the math, but estimated that we’re either at break-even this year or definitely in a few months. In our first year of Solar use, we had a credit. Which, as we found out, we could not claim. Because, it turns out, Net Metering means that though we’re credited for the production at a $ rate, customers are paid out on OVERPRODUCTION of power and not on the CREDITS earned. What this means is the system produced greater kWh of energy than consumed by the end user. If this is the case, the customer is PAID OUT the power times the wholesale rate of production. 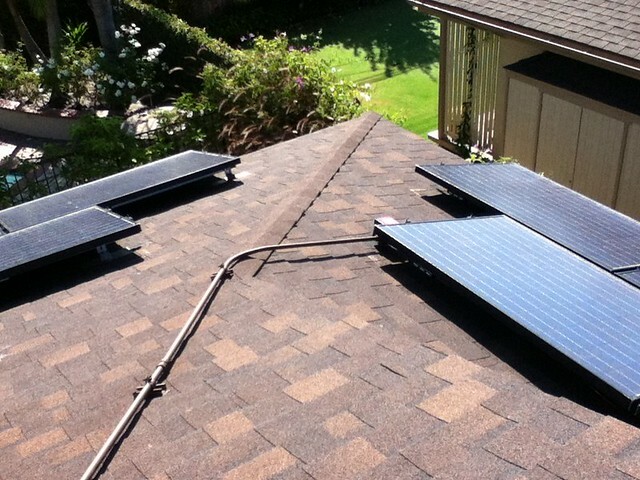 Last year, we paid over $200 to SCE for the entire second year of Solar. This third year, coupled with our nearly a month of travel to Maine and back in our Here, There, and EVerywhere roadtrip, we’ve been out of the house for about a month. So, that created a month of overproduction. As a result, the annual net metering statement was for approximately $40 for Year 3. This full third year of solar production is basically the Model S and Roadster. What is interesting is that our usage this past 3rd year probably would have cost us less than Year Two’s Annual bill. But the month off really helped. At less than $4 a month for power for the third year is greater than I expected. So, I chalk this third year as a monumental year. Considering our average electric bill prior to going EV and solar was closer to $200 a month, it is incredible to get most of our transportation and home energy use at so little. Now, this current fourth year, I wonder what our bill will be. Most of the past three years our electric tariff was on TOU-D-EV. This was a special whole house rate with a discount for EV drivers. A few months ago, Southern California Edison got rid of that tariff and adjusted the Time of Use tariffs so that the times that start with Peak, Off-Peak, and Super Off-Peak. Under TOU-D-EV, the Peak rates were from the hours of 10am-6pm M-F, the Super Off-Peak hours were from midnight-6am every day, and Off-Peak is any other time. This was great because Solar was credited during the peak times most days and helped off-set a lot of the costs. Under TOU-D-A, the Peak rates are now from the hours of 2pm-8pm M-F, the Super Off-Peak hours are now from 10pm-8am every day, and Off-Peak is still any other time. Though the Super Off-Peak hours are longer, the effect of moving peak time to the hours between 6pm-8pm means that we’re no longer generating credits at the Peak rate between 10am-2pm. Additionally, we’re spending more between 6pm-8pm because we’re paying at Peak rates and not Off-Peak rates. So, I’m projecting paying a little bit more for electricity next year… Unless we go on yet another LONG roadtrip. Posted on September 29, 2015 April 20, 2016 Categories Solar, Tesla, Tesla Model S, Tesla RoadsterTags Net Metering, SCE, Solar, Southern California Edison, TOU-D-A, TOU-D-EV3 Comments on Our third year of Solar usage. So, we got our bill for the second year of Solar usage from SCE. It’s been two years since our PTO was approved, and, as opposed to last year, when all we had was the Active E, we pretty much used at LEAST two EVs, if not three EVs over the past year. In our first year of Solar use, we had a credit. Which, as we found out, we could not claim. Because, it turns out, SCE’s though we’re credited for the production at a $ rate, with net metering, customers are paid out on OVERPRODUCTION and not on the CREDITS earned. What this means is the system has to produce greater kWh of energy than consumed by the end user. If this is the case, the customer is PAID OUT the power times the wholesale rate of production. Last year, we had a lot of credit as we primarily used energy overnight (at Super Off-Peak) and produced power during the day (the Peak rate). 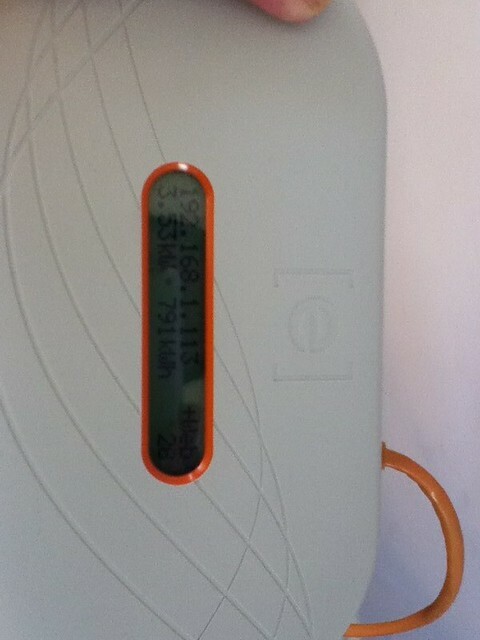 However, we actually used more kWh of energy than we produced. So, even though we had a credit last year, we were not paid out. This year. We got our Tesla Roadster in the beginning of September, so, when our second year of service started, we were pretty much using TWO EVs. Then we got the Model S, and we were using three EVs during that time until the Active E was turned back in at the end of February. Regardless, the Model S and Roadster consumed energy at a greater rate than the Active E, so we did use more energy than we produced AND totaled a higher amount than we had been credited. Thus, the bill. 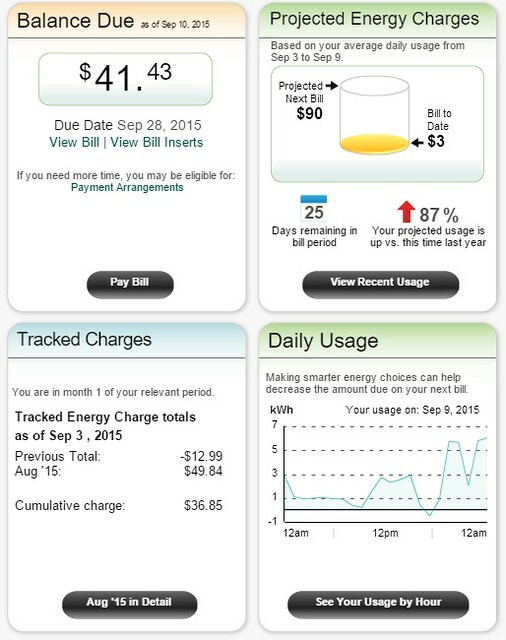 Even so, at approximately $20 a month for all the driving that we do, and the home power usage. It’s still a win! 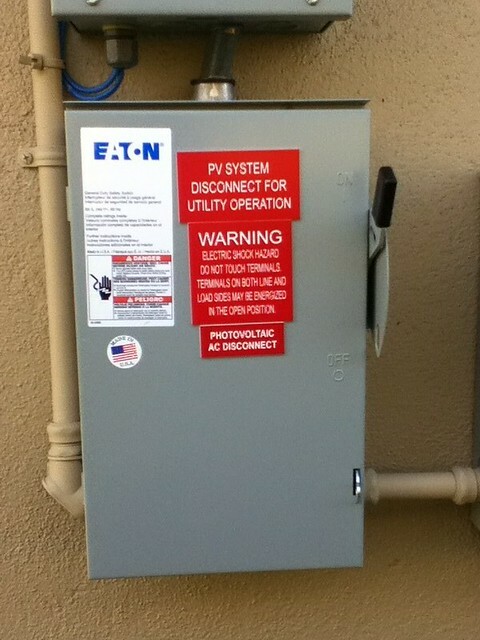 Posted on September 6, 2014 April 20, 2016 Categories ActiveE, Solar, Tesla Model S, Tesla RoadsterTags Net Metering, SCE, Southern California Edison2 Comments on So, we got our bill for the second year of Solar usage from SCE. 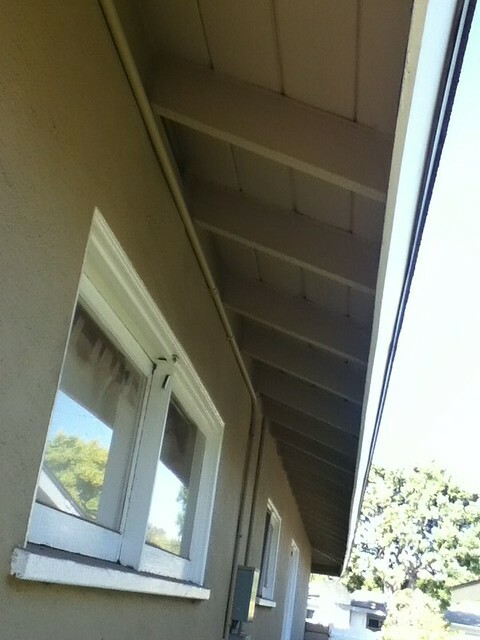 This is what the front of the house looks like. One of the good things about our house is the fact that the south facing roof (the one with the most power generating capability) is not on the front of the house. This fact made it easier to sell Solar Power to the better half on the aesthetics of the solution. 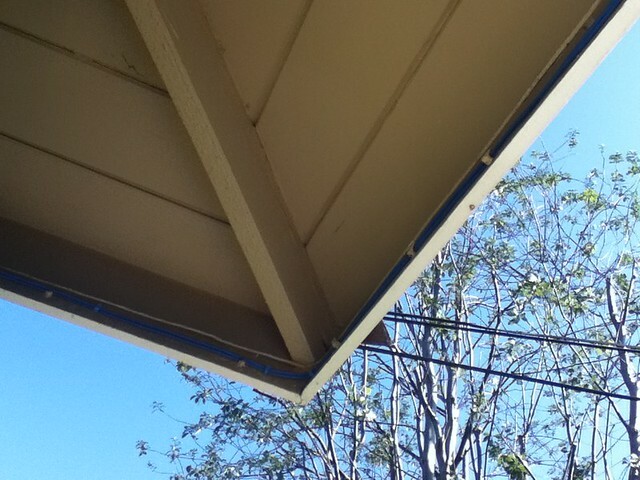 So, the next picture is from the backyard looking up. 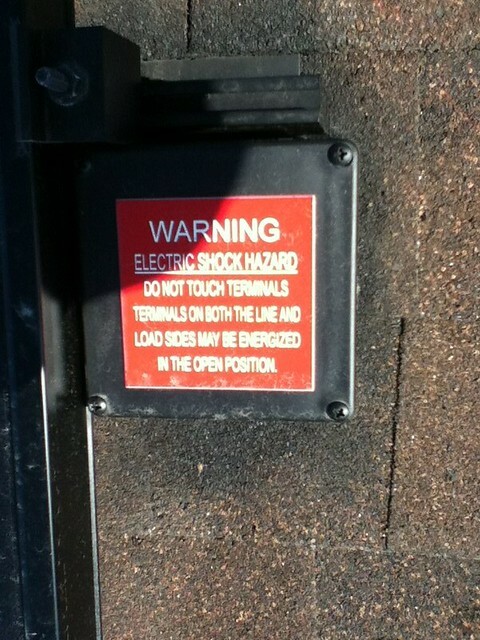 That doesn’t really give you a good shot of it, so… Even though I have a fear of the sudden stop after a fall… (i.e. it’s not really the heights that scare me or kill you.) 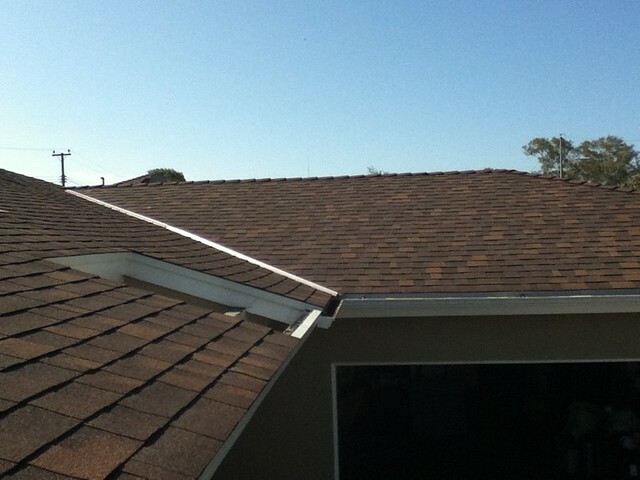 I decided to get on the roof to take some pictures. 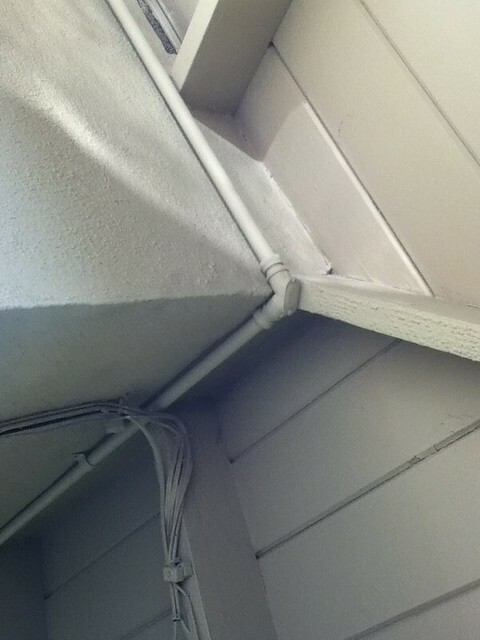 Here is a nice shot of the conduit runs for the electrical cable. 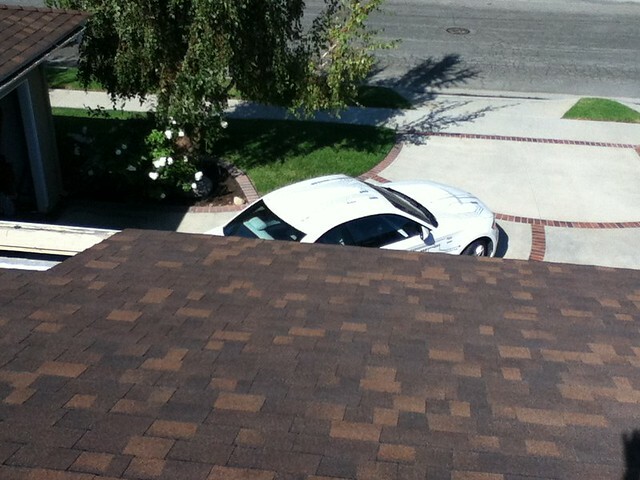 Here’s the ActiveE peeking out from the roof. 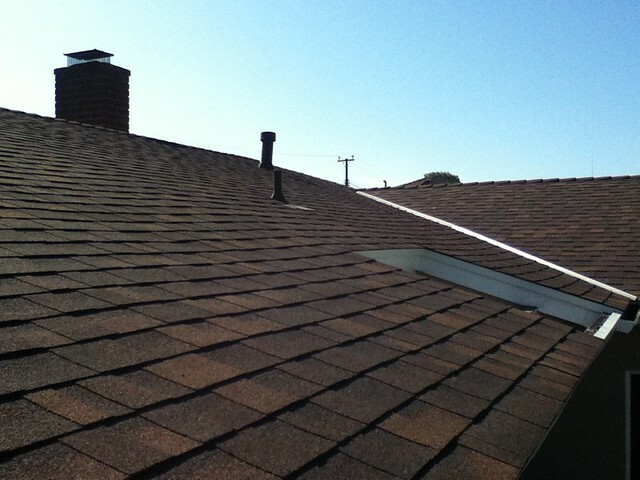 Here’s a shot of the junction from the South Facing and the West Facing roof… The conduit still looks good. Panoramic by the chimney. The shading really wrecks havoc on my production for three of the panels. Meter is going backward! Success! 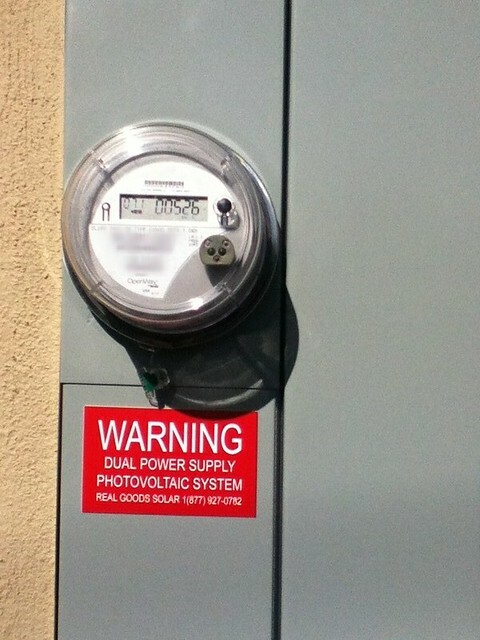 One of the things you get with Real Goods Solar under this plan is TWO monitoring systems. 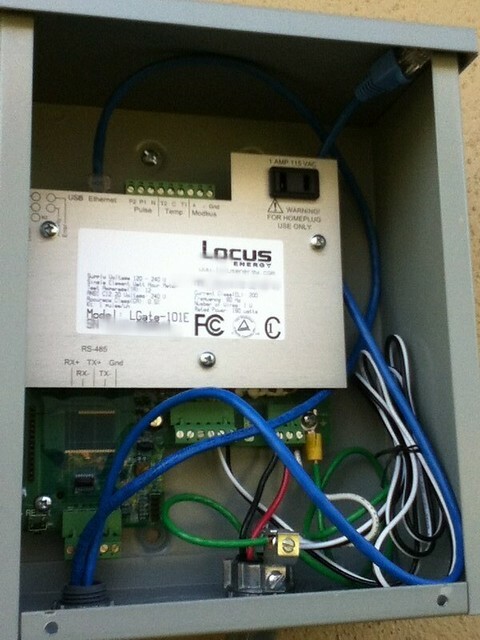 This one is a closed system mounted by your panel and it is for the finance company to ensure that they’re producing what they committed to. 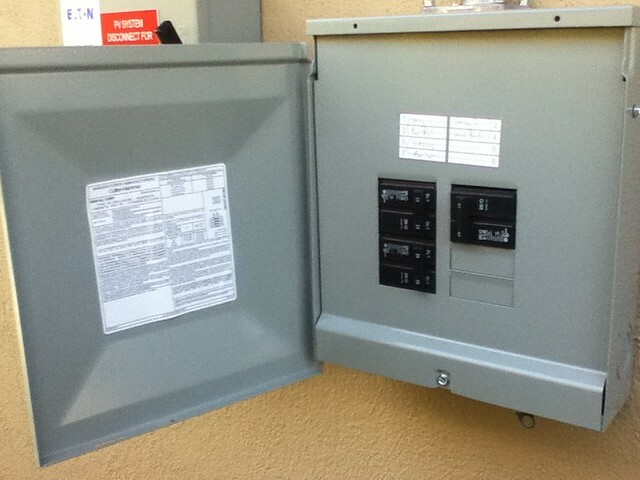 Here’s the one from Enphase that allows the user to see what the system is producing. 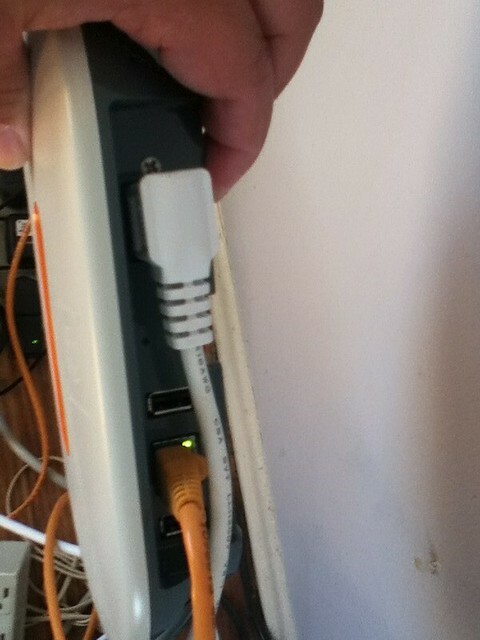 It connects to the panel via Ethernet over Power and then you need to have a port on your router to connect to the Internet. Lastly, the installation was very clean, here is where they ran the power to the main breaker as well as the Ethernet for the monitoring. 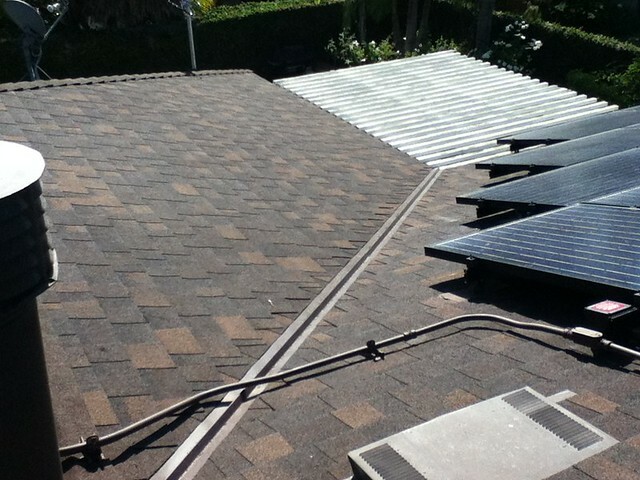 The conduit on the left side (on the wall of the house) is where the power comes from the solar panels to the main panel. I asked them to run two Ethernet runs from the monitoring to the wall so that there’s one spare in case of failure in the future. This sucker is supposed to last 20 years. That’s it. Several THOUSAND WORDS worth of pictures. More Napkin math, OR – Real Goods Solar and BMW’s program is a REAL GOOD deal! Saving money while saving the environment is an addictive process. It’s crack for good Karma! I feel like Michael Corleone in the Godfather III, I try to get away from it, but they keep dragging me back in! As I had indicated on my Ping! post, I got “unofficial” Permission to Operate (PTO) on August 17, 2012 and finally received official PTO ten days later on August 27, 2012. So, we’re now running our car on Solar Power… or are we? 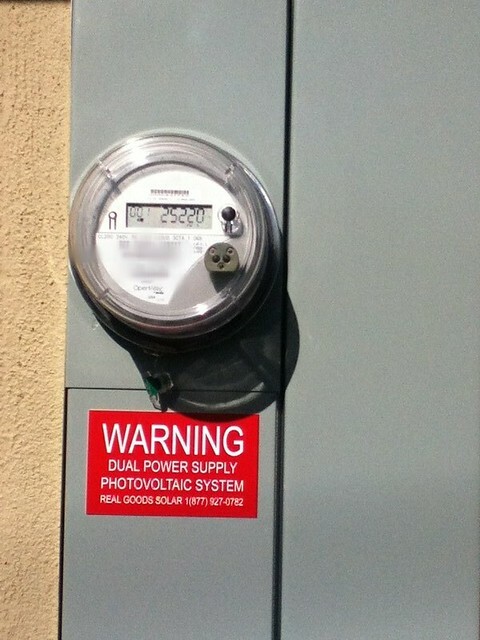 Unless your house is completely disconnected from the electric grid, what you are really doing is netting out generated power from the solar panels on the roof with consumed power from the electric grid. So, if you’re overproducing power from your solar panels than what you’re consuming, you get money back, otherwise you’re really just netting out what you’ve made with what you’ve used. As I have published previously, the rate to charge depends a lot on what tariff you’ve chosen. By my third napkin math post, I attempt to alleviate that $0.31 per kWh charge by opting for the whole house SCE Electric TOU Tiered rate structure, this pretty much reduced my rate to charge to $0.13 per kWh for my car charging needs (as well as my pool pump as I switched the time of use for that from mid-day to mid-night to 6 am). As we noted on that post, my cost per mile dropped to about 1.412¢ per mile. 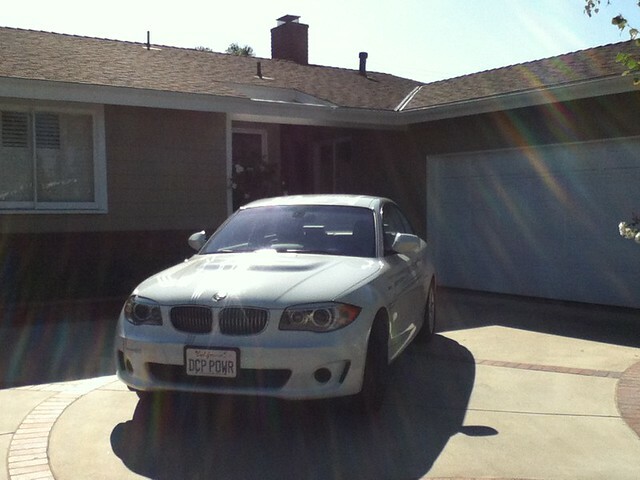 So, the big question is what is my cost per mile under the Real Goods Solar and BMW ActiveE program deal. Before I took advantage of this deal, I would like to tell you about my search to save our energy costs further. Not necessarily the environment, but that’s always a fun side-effect with this accidental environmentalism that I’ve stumbled across. After signing up for the Active E, I figured to become educated on what my solar options were. To that end I requested quotes from three solar companies in the Los Angeles County area: Peak Power Solutions (Sunpower reseller), Solar City, and Verengo Solar. Each solution had its strengths and weaknesses and around the third week of March (between three to four weeks of receiving my ActiveE), I decided to sign a power purchase agreement with Solar City. A power purchase agreement is basically the right to buy a guaranteed amount of power from a provider for twenty years. 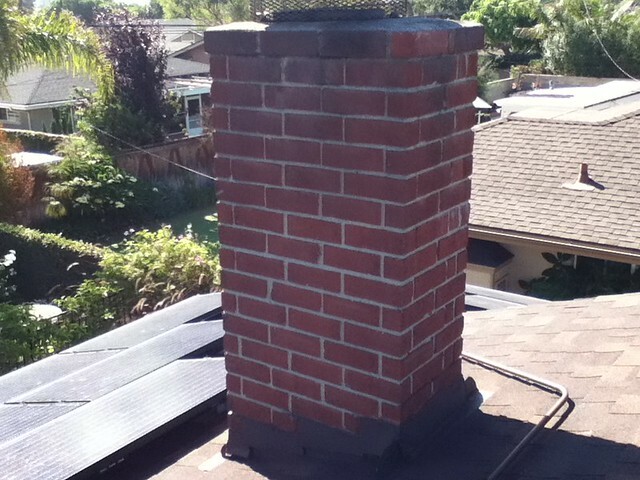 I don’t own the solar array on my roof, someone else does (a finance company) and I agree to pay them a fee for this. This means at the end of twenty years I get the option to keep buying from them, buy the equipment outright, or have them remove the array from my roof. So, how did I compare the suppliers. Ultimately, economics. So, at the end the Solar City deal that I had originally signed was approximately $0.10344 per kWh. How did I calculate this? All the suppliers with the power purchase agreements have a guaranteed rate of production for the 20 years that the system will be produced, so I divided the total guaranteed kWh by the the total prepaid lease amount, and that’s how I got to the $0.10344 per kWh. So, I thought that was it. 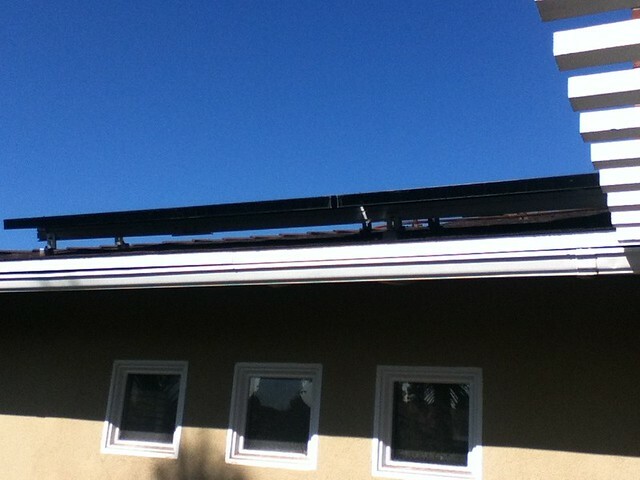 I signed up with Solar City, got a rate that I felt was fair and waited to get installed. 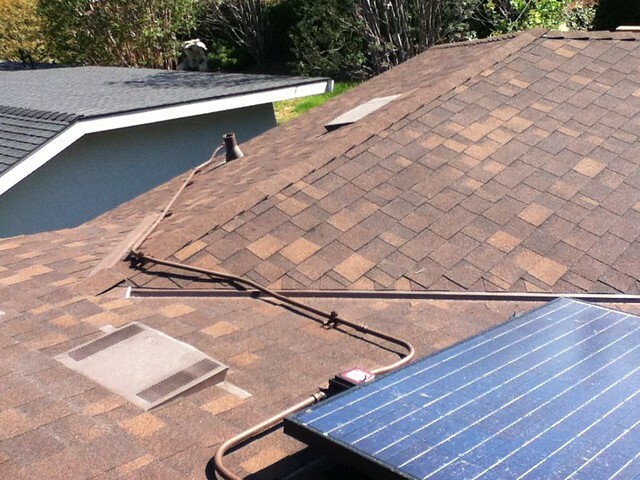 Solar City’s installation process was methodological and professional. They provided a website to track the progress of the installation and was quite impressive. However, their process proved to be the opportunity for Real Goods Solar and BMW’s deal to come in and make my costs even less. 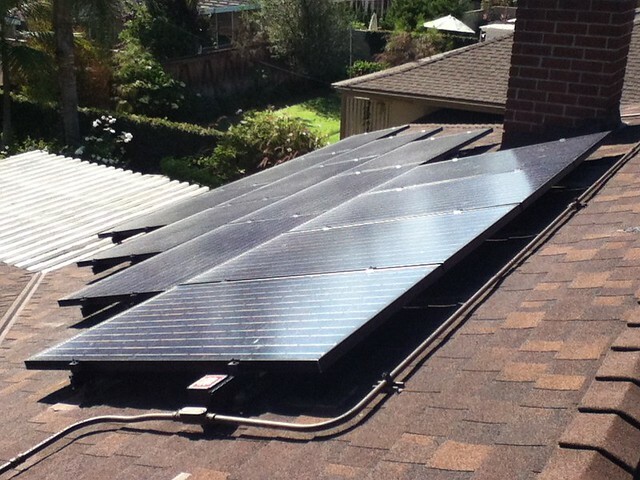 Around the beginning of May, during the design and survey process, Solar City notified me that in order to proceed with the installation of the system that I signed in the third week of March (about five to six weeks earlier) my roof would have to be replaced. This change provided me with an out-clause from completing the agreement that I signed with Solar City. 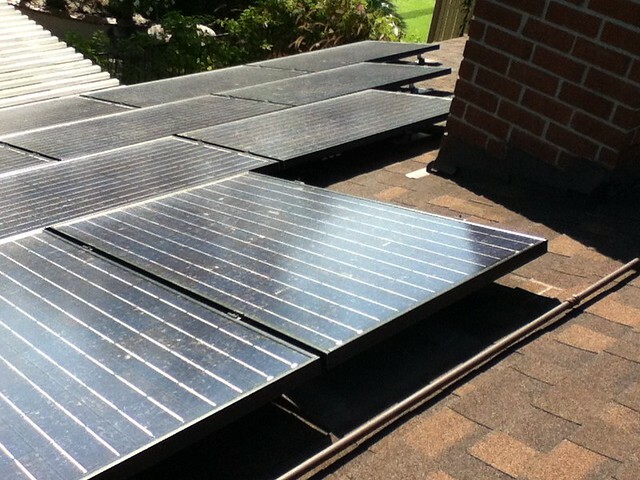 As I was mulling through a roof quote and setting up more roofers to see what this replacement roof would cost me, Real Goods Solar and the BMW Active E program announced their program. So, I figured, why not ask them to see what the solution would cost me. I contacted Real Goods and they had a sales agent contact me within the day. Their initial quote was 12% less than the Solar City quote and agreement that I went with. However, I had to bundle in the cost of the replacement roof and needed to get the total project cost to figure out which deal I was going to take. Figuring that both solar companies would probably be able to get a reliable, professional, licensed roofer at a lower cost than I would have on my own, I went back to both providers to find out what the roof was going to cost from them and go from there. My assumption was not exactly correct as my independent roofer quote was actually $500 to $1000 cheaper than the lowest quote from either solar provider. I was at an inflection point. I was already saving quite a bit on gasoline with the TOU tariff and this would have been the time to quit or cut bait. I approached both providers to see if there was anything they can do to their quote to make the entire project less expensive (replacement roof and solar). 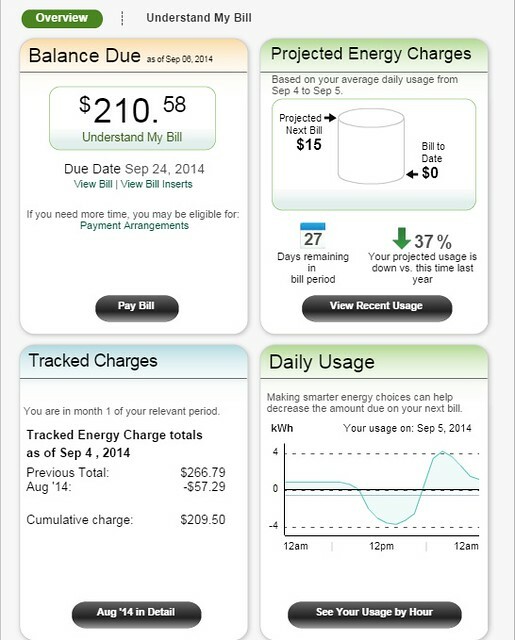 The dilemma is how do I adequately calculate my cost per kWh based on the various scenarios. I figured the most conservative thing to do would be to subtract the lowest roofing quote from my total project cost and use that figure to divide my cost per kWh over the guaranteed generation over the life of the system. Granted, this methodology would provide me with an understatement of cost as the guaranteed rate of production is typically rather conservative of the suppliers, but it IS what they guarantee, that is why I went with that methodology. When the system has really sunny days it will outperform this guarantee and my actual cost per kWh is less than what I calculated. With the total system cost, I figure that my cost per kWh is $0.10250, however, if I subtract the roof cost my cost per kWh drops to $0.07970 based on guaranteed power. Seeing that my energy cost is a 38.7% reduction, mathematically speaking, my cost per mile is approximately .8657¢ per mile ($0.008657) or 73.58 cents per day based on the 85 mile day that I had in the last post on this matter. Not bad at all. Of course, the system is currently overproducing and with time of use I actually am paid a rate for the energy I am sending back to the grid during the day and most of my charging occurs between midnight and 6 am, so this is, like my other estimates “napkin math”, so I am certain my actual costs are lower, but the numbers work for me. Remember, my original calculation of a comparable vehicle costs were approximately 17 cents per mile, so my 0.8657 cents per mile cost is quite a bit less than driving my ICE 328i convertible. So, there you have it. My energy costs are a heck of a lot less than it has been. Want to see what my system is producing, check out the sidebar production information courtesy of Ken Clifton‘s plugin for WordPress or directly from Enlighten’s website. In a few days, I will follow up this Napkin Math article with pictures and my opinion on the installation from Real Goods. Let me just say, I recommend them and if you give my name, I get a referral on your system, so contact me if you’re serious and I will recommend them. Posted on September 23, 2012 April 20, 2016 Categories ActiveE, SolarTags ActiveE, Comparing Gas vs Electric, Gas, ICE, Real Goods Solar, SCE, Solar, Solar City, Solar Power, Southern California Edison1 Comment on More Napkin math, OR – Real Goods Solar and BMW’s program is a REAL GOOD deal! 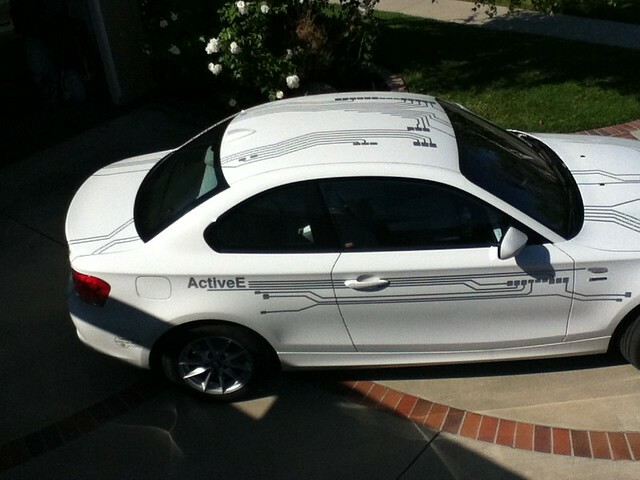 I’ve been busy with our ActiveE and have been on vacation on top of that… I promise at least two more ChargeIt! articles for two really great food AND charging facilities (here’s one of them – Gjelina at Electric Avenue in Venice). [Here’s the other Church and State – Mateo Street Charger, now caught up for the Great Food series.] However, trying to decide on whether to do the next article on joining the Solar powered movement. Still haven’t received my “official” PTO, but I did notice an off-cycle close to my SCE account this past Friday (August 17) (when I logged in to my SCE account on Saturday) and followed up with a call to SCE on Saturday morning. According to the telephone representative my permission to operate (PTO) letter went out last week and I am now generating my own energy via the Solar Panels on the roof of the house. Thanks to BMW and its partnership with Real Goods Solar, I was able to get a system at a bigger discount than I had originally negotiated with Solar City. But that will have to be the subject of a subsequent post. As well as updates to my Back of the Napkin Math series (1) and (2).